We would love to hear about your next project! With over 36 years of experience transforming landscapes and building professional pools, our proven process can bring your dreams to reality. Oh well… We never get tired of winning design awards or helping our clients win them. In these circumstances, Patty and Mark Smallsreed of Marana, AZ snatched the top ASID award for their breathtaking backyard and sparkling curved pool. 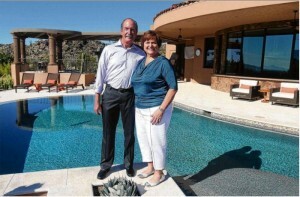 The article written by Elena Acoba and printed by the Arizona Daily Star details the features of this wonderful backyard and its impressive pool. We reproduce it below with a link to the original article. For Patty and Mark Smallsreed , the search for property on which to build their custom retirement home was all about the backyard view. 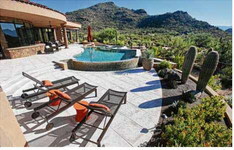 The Chicago transplants found a sweeping vista in Marana’s Dove Mountain. A cactus-studded hill looms to the east, while lush undeveloped desert falls away to the south. In the distance, downtown Tucson dots the horizon. 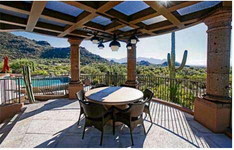 The constructed space from where the Smallsreeds enjoy that view won this year’s ASID Design Excellence Awards from the Arizona South chapter. ASID, which stands for American Society for Interior Designers, presented the awards in September. Lori Carroll, owner of Lori Carroll& Associates LLC and an ASID member, submitted the nomination of the Smallsreeds’ backyard for the outdoor living space category. While she accepted the award, she says ‘it was truly a team effort’ to develop the five-level backyard. Carroll was responsible for furnishings, accessories, the color scheme, lighting, sound system and accent elements. Others involved included architect Soloway Designs, landscaper The Garden Gate and contractors Mike Wachs Construction Co. Inc. and Cimarron Circle Construction Co. The Smallsreeds worked with the architect, builders and designer for more than a year before breaking ground in 2012. The home, which the couple moved into last year, has a Tuscany exterior, but a modern interior design. Those styles are meshed in the yard, where Carroll focused on simple lines for the furniture and open spaces dotted with intimate gathering spots. Old World stone and red tile are used in contrast with smooth concrete floors and sparkly glass tile for the pool. The plants in the living space are a collection of sculptural succulents, including knobby cereus, the twisty stems of lady slippers, the artichoke-like truncata agave and fat barrel cactus. Saguaro cactus, palo verde and Mexican honeysuckle help the yard transition to the undeveloped desert that is part of the Smallsreed property and beyond. The couple had one major goal for their backyard when they started looking for a site in 2006: It would be an inviting place that allows them to spend as much time as possible outside enjoying spectacular views. 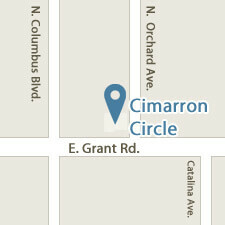 The reason was simple–it was a change of pace from Midwest living. ‘You can’tlive outdoors in Chicago most of the year,’ says Mark. The patio overhang and the sliding lanai doors help to extend the feel of the interior great room into the outdoors. Dark chocolate browns, tangerine oranges, sandy tans and jewel blues tie indoor and outdoor elements together. A large gathering area under the overhang is protected from high sun and calm rain, while a smaller seating area provides a little more sunning. Three lounge chairs with adjustable backs sit in full sun for warm relaxing andnapping. 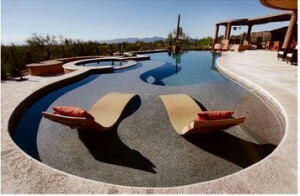 Two molded-plastic loungers are filled with sand to anchor them to the floor in the shallow end of the 6.5-foot-deep pool. Bathers sitting in the chairs can stay cool because they are partially submerged in the water. The end of the day often finds the Smallsreeds enjoying the spa. Mark’s favorite spot is the outdoor kitchen. Besides the usual bar sink, gas grill and mini-frig, there’s a wood-burning brick oven and a Big Green Egg smoker. The oven is used mostly for making pizza, but it stays hot enough overnight so that the Smallsreeds can bake a breakfast casserole in it the next morning. The island allows people to gather close to the cooking action. A few steps away is a formal dining area for six that has the highest views of the backyard. Both are tied as one space by the metal lattice ramada. It and the patio overhang are held up by roughly textured canterra columns. As the sun sets, the colors of the glass tiles along the pool sides change from brown and tan to aquamarine and deep blue. From afar the twinkling lights of the city provide a soothing night backdrop. Candles, lanterns and spotlights softly illuminate the open areas and gardens of the backyard. A metal fire bowl is lit up by gas-fed flames. Patty jokes that they’ve dubbed it the ‘Olympic cauldron’ for the way the flames arise from inside. Another fire feature is Patty’s favorite place in the backyard. In a nook down from the pool is the fire pit. Inside a concrete ring is a metal sculpture that looks like a pile of thin logs propped against each other. Gas-lit flames lick through the sculpture like a real campfire. Seating circles the ring.